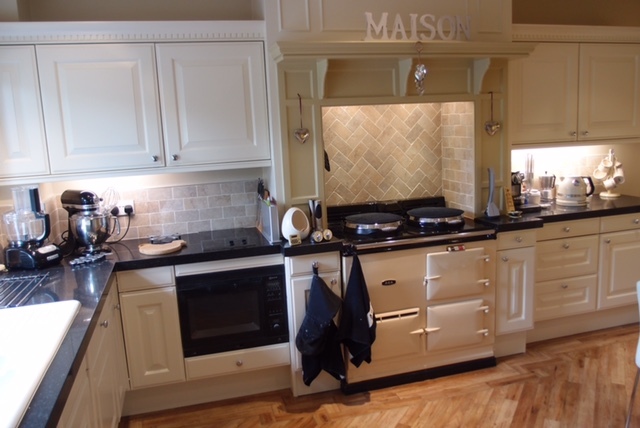 Anne & Rory, were researching hand painted kitchens on the internet, and looking at my web site they thought I was the right man to repaint their Mark Leigh kitchen. They said there was more to the project than painting which is sometimes the case. From the pictures, I was able to work out a timescale and the extent of the kitchen painting work involved. This would also work out what they should expect to pay for my labour and materials. My proposal met their approval and we made an appointment to call by to discuss the overall project. When I went to have a look at the kitchen, the units were exactly as portrayed in the photos, but to be honest, the visit was more about how to deal with what was needed, beyond a custard paint colour change. On looking at the kitchen, it was well made, a Mark Leigh of Lancaster, and was well worth rejuvenating with a hand-painted finish. 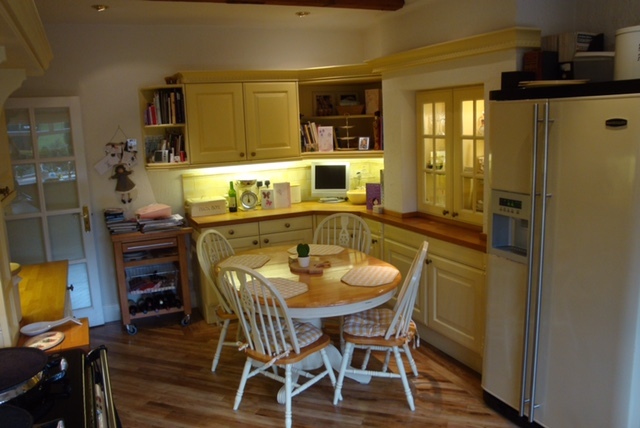 However, the cabinets were indeed very yellow; the wall tiles made the whole kitchen look even more yellow, and the ceiling and walls were covered in beautiful artex! 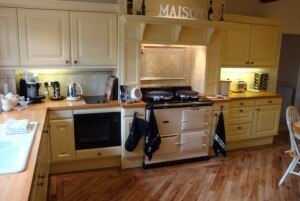 It would certainly need some work by other trades to advance the kitchen from dated to timeless and elegant. Talking it through with the clients, they were keen to have the wall tiles removed and the room re plastered, and beyond that, they needed help to pick colours and general advice on how to go about getting this project done well and with the least upheaval? Having a good network of other trades to call on, I knew I could recommend my mate, Wayne Addicott, for plastering and tiling. Next problem – colours, and as with all jobs, you need a starting point, so we needed a tile shop. Working near Garstang, I knew a fabulous who have the most beautiful marble, stone and ceramic tiles, and more besides. I suggested that the clients go along for some inspiration and then I would meet them there and discuss the colour options. They came up with two tile choices, but we all agreed that the warmer tone with a Jasmine white grout was the right one for the kitchen. With that decided, we picked a New White to complement the tiles. (For a bit of pizzazz, I thought a herringbone pattern tiled feature above the Aga would work well. That was agreed.) Wayne was booked in to complete all the works prior to me starting. Painters are in, everyone is out! When we get asked for advice on what order would you should refurbish a kitchen, we’d say that the last person in should be the painter. Get all your structural work finished, modifications to units done, work tops templated and fitted, floors laid, room cleaned… and then it is ready for the finishing touch. Experience says that without having finish painted cabinets to worry about, every other trade can work faster and more relaxed. Experience also seems to suggest that overall, a seamless kitchen refurbishment is surprisingly hard for a lot of companies, let alone homeowners, to pull off, unless the project manager is on top of things! Working with likeminded tradesmen you know is a great advantage. On the other hand, a colleague last week thought he was the last one in on a high end kitchen, but had to contend with the client’s builders’ boot prints on his doors. He had to put his own foot down when the whole work area, including wet paint was subsequently covered in a fine layer of grinder dust too. How did Wayne the plasterer and tiler do? When I came to start painting the units, the transformation of the room was fabulous. Wayne had made a great job, the kitchen was ready and he was nowhere to be seen. Brilliant. Now it was my turn. I tackled the kitchen the same way as usual, using my favourite citrus-based cleaner. Rubbing every surface clean with the Mirka Mirlon pads. Once dry, I gave everything a light rub down with Abranet, using the dustless system. I dusted off everything and wiped over with meths to ensure a thoroughly clean surface. Now for the paint, Otex base coat followed by 2 coats of Tikkurila Furniture Feelings supplied by Holman’s. I’d also ordered some new brushes. With constant use, synthetic bristles do wear down. I tried the Wooster and the much talked-about Rembrandt. With the job nearing completion! All it needed was a clean up and a bead of silicone around the kick boards. Now ready to hand back to Anne. During the initial stages, we had also discussed changing the cupboard door knobs. 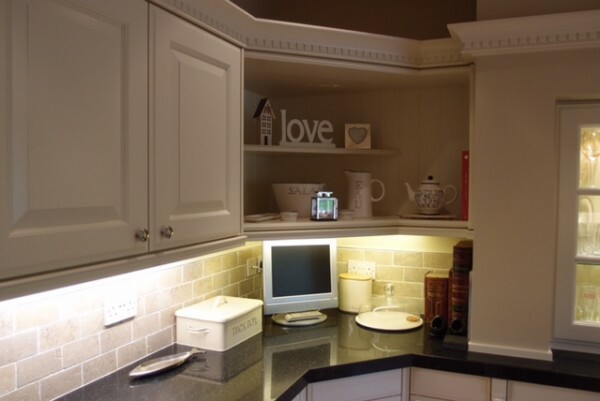 This is probably the simplest and most cost effective option for upgrading a kitchen and changing the look. I use Slingers, who have been trading since 1858. Their website is vast and the service is brilliant. Myself and Matt enjoyed our time in Scorton and I would like to thank Anne & Rory for their kindness whilst we were in their home. 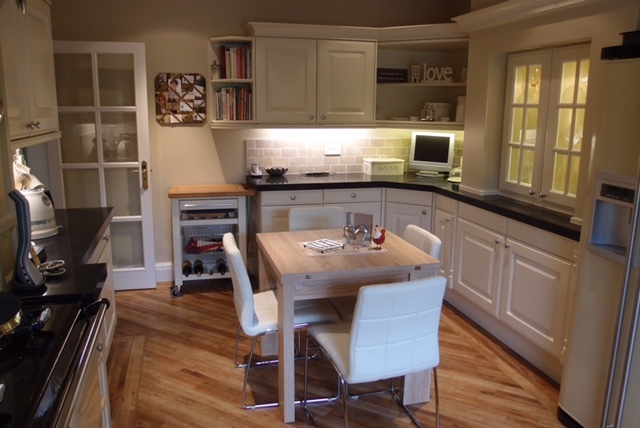 Specialist Kitchen and Furniture painters. JS decor are the first port of call for hand painted kitchens in Lancashire or Cheshire. I have been hand-painting kitchens since 1993, trading as JS Decor; and I also write monthly tips for the Lancashire Magazine.